Air is something that surrounds us 24 hours a day. In fact, our existence, as well as earth’s depends on it. At Daikin, the future of the world’s air is our greatest concern. We, the manufacturer of world’s best air-conditioners, are always paving the path to save our environment for next generation. We phased out all R-22 model and shifted to the green refrigerant R-32. Now, whole world is coming together to find and work on way to address global warming issue. We are also offering worldwide free access to patents for equipment using next generation refrigerant, R-32. Refrigerant choice is a key in saving the ozone layer and reducing global warming. 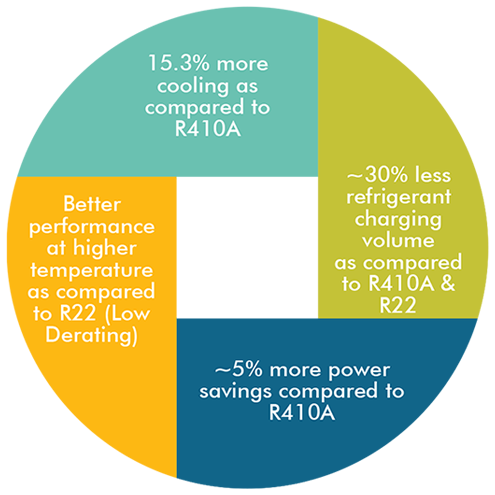 Our RA models manufactured in India use the next generation refrigerant, R-32. R-32 has zero Ozone Depletion Potential (ODP) and Modified Global. Warming Potential (GWP) of 472, compared to R-410A’s Modified GWP of 2,027. Also R-32 is a single component refrigerant, which makes it easy to recycle. 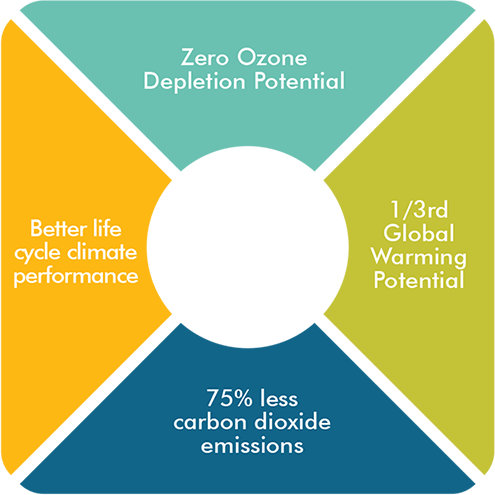 It is because of these reasons that R-32 offers the lowest total emissions and best overall life-cycle climate performance.